I bought these damned shoes on 11/11/2016 and they still aren’t broken in properly. I bruise and bleed every time I wear them. When I asked the Doc Martens guy if there is a better way, he shook his head and said, “Badassery is pain.” Could badassery also be “paying someone to wear your shoes for a few months until they bend and soften”? I’ve read that some people take a hammer to them. Some set them on fire. Dear God with these shoes already. Yesterday I learned that the sight of someone eating an ice cream cone in a nail salon really bugs me. Add another layer of distress when the cone eater is waddling around with foam toe separators. Those are very cool looking shoes. Bummer they cause problems. Maybe take them to a shoe repair shop and see what they can do? I’ve had luck using an extra pair of socks (or two) and a blowdryer breaking in shoes. You put on the extra socks and your shoes, warm them up with the blowdryer, walk around until they cool off, repeat. With Docs it seems like you don’t break in your shoes, you break in your feet. Ouch! Our local , family owned, shoe store has a machine to soften shoes. Maybe there’s one by you ? First, someone solemly hangs a picture of FDR up behind the podium, after which a procession of people limp to the microphone, tell their polio story, then limp away. The picture is removed, and the polio party ends. 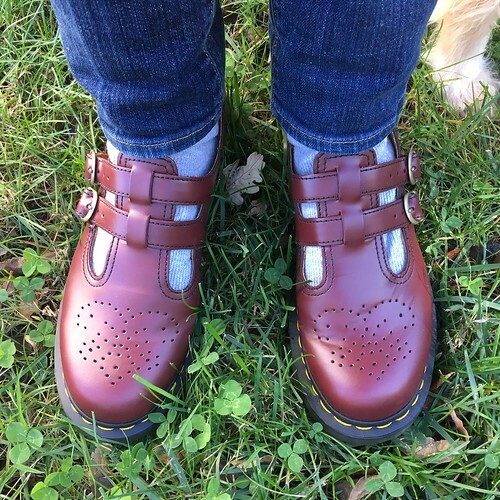 Are your Doc Marten Maryjanes size 39 by chance? I would be glad to break them in for you! I vote for the hammer approach. What could possibly go wrong? Pro dancer tip: soak your socks in vodka (though presumably any alcohol would do… maybe not Malibu :/ ). Put shoes on and wear them. Works, apparently. Previous Previous post: Oh, Panda. Next Next post: Never miss an opportunity.